Fine Art Photographer Marge Agin captures Bluffton, and vie versa. “I’ve never felt as comfortable, as soon, anywhere else. This is a completely welcoming society.” Fine art photographer Marge Agin put it this way when asked what inspired her new book, Bluffton – Changing Tides. Life itself is so poetic that artists can just barely keep up. 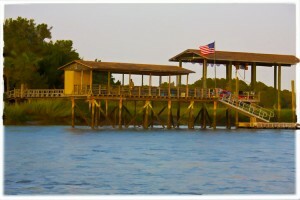 So it’s practical, in a way, that to share Bluffton in a book Marge created photos that look like paintings. Once thought to be a breakthrough in realism, photography now is a medium with as many possibilities as oil or watercolor, as many moods as impressionism, as many textures as brushstrokes. Marge called on all that versatility to explore Bluffton, and her work comes as close to the famous “state of mind” here as anything ever did without breathing. Changing Tides is fresh, immediate, true to the moment – – and yet also faithful to the molasses-paced sense of time, reflection, perspective and repose that you sense when you walk in Old Town Bluffton. But her account of working in the digital layers overlooks a fact that leaps out from every shot. She has the eye of a painter. What Marge puts inside the frame, and where it’s located, reveals a sense from centuries before the camera, much less the computer.There is an uncanny “rightness” about each of the photos in the way they say Bluffton. Words behind the pictures were important inspiration, too. Third-generation Blufftonian Emmett McCracken wrote the foreword that serves as Marge Agin’s touchstone. “Emmett’s preface set the tone for the book. He was more instrumental than he thinks he was.” True of so many projects Emmett has nurtured in this town he describes as close to Heaven. Joan Heyward contributed quotes and brief writings by the late Thomas G. Heyward, the emblematic Blufftonian whose line in the Lowcountry went back to a signer of the Declaration of Independence. Tommy Heyward’s love of Bluffton was expressed as colorfully over the years as anyone ever achieved, and many of those thoughts are shared on the pages of Changing Tides, thanks to Joan. Editor Charlene Gardner, of Four Corners Gallery in Bluffton, pulled the book together and produced a clear, beautiful, ideal volume to contain these images, words and feelings. Her talent for knowing how a particular work is best presented shows here on every page, cover-to-cover, outside and in. Bluffton – Changing Tides emerges as more agile than a “coffee table book,” yet too big to be overlooked – a perfect canvas for these images. For a place near you to buy Bluffton – Changing Tides, just ring up the editor, Charlene Gardner at Four Corners Gallery 843-757-8185. That’s the way they’d do it in Bluffton.You can buy a copy if you wish at book stores and cool places all over Bluffton and Hilton Head Island, from Booksalicious in the Bluffton Promenade, to Barnes and Noble on the Island. At Gigi’s, The Store and Eggs ‘n’ Tricities on Calhoun Street. Decorators dig the book so much that it’s available at J. Banks Design on Hilton Head.